All Forums >> [Artix Entertainment Games] >> [AdventureQuest] >> [AQ Encyclopedia] >> Info. Submission >> Pets/Guest - Read the first post! These threads are not meant for skin questions Please use Questions/Answers for that. Only questions pertaining to crucial information that is missing or hasn't been posted by the AQ staff by accident are allowed. For example missing SP costs for a misc or missing BtH numbers regarding a weapon etc. An posts that deviate from the AQ Encyclopedia Rules will be deleted and warnings given out as deemed necessary. This savage Grenwog doesn't put on a yellow suit and pilot a mech, but it can strike with its armour-destroying claws or with a powerful uppercut! 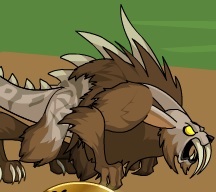 **Click to have your Sabre-Toothed Grenwog attack with their armour shredding claws! **Your Sabre-Toothed Grenwog will now strike with their armour shredding claws! *†Click to have your Sabre-Toothed Grenwog attack with a powerful uppercut! ††Your Sabre-Toothed Grenwog will now attack with a powerful uppercut! *‡The savage claws shred your foe's defences, rendering them more vulnerable! ‡‡Your foe endures the savage claw slashes before their armour is shredded. This small fragment of Loco's power doesn't need to be recharged, he's plenty energetic himself! During the month of April, this little guy can channel more of Loco's power, dealing a lot more damage! Normal price, basically it's MCed for Guardians outside of April, does anywhere from +0% to +10% damage per hit. During April, it becomes MCed for everyone, and will do anywhere from +0% - +30% damage. Call forth the robotic facsimile of Zorbak, Zorbot. What Zorbot lacks in raw ebilness it makes up for in versatility, striking with either Energy or Darkness to cause maximum damage. 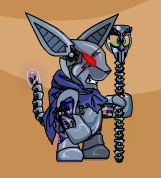 For your exceptional valor in the Thursday the 12th war, you have been gifted with Zorbonyx, an ebony version of Zorbot whose power grows with your own. 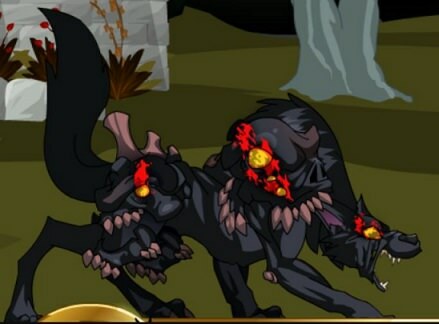 Zorbonyx will strike with either Energy or Darkness to maximize damage. Call the masterful Katshiro to your side! With this skill, Katshiro will use his Sol-Style attacks, striking with the more powerful of Earth or Light damage! Call the masterful Katshiro to your side! With this skill, Katshiro will use his Luna-Style attacks, striking with the more powerful of Water or Darkness damage! Cat spirits are extremely rare in the wild, such that having one as a pet is said to bring you good fortune. This one looks a lot like the Neko's sun spirit, Sol. Cat spirits are extremely rare in the wild, such that having one as a pet is said to bring you good fortune. This one looks a lot like the Neko's moon spirit, Luna. Clone of Retro Twilly, only heals the player, MC is a 20% chance of a +25% power heal. Does *0.9 damage due to being always useful and *0.85 due to it auto-hitting. MC Earth pet. Level is the same as the Piñata you fought, and it gets the Guardian boost if you're a Guardian. Attack is one Melee hit. Don't think we ever got subs for the Royal Raven guest from the Skycastle house, did we? EDIT: Also, Pinatazard's fear effect seems to be affected by earth resistance. On an enemy with 80% earth, it was 80% chance, and it was 130% chance on an enemy that was weaker to earth. Earth pet, no base/rand or BtH lean. MC effect is toggled between damage mode (+5% damage) and status mode (pays 5% MC and half damage = 22% Melee). In status mode the pet fires a beam that will randomly attempt to either do EleVuln or DefLoss. 22% Melee on a 50% save means it's worth +(44/1.4)% damage. Split it over two turns for +15.71% damage for 2 turns, stacks as per usual. Beam does two hits, so it'll inflict <Hits> turns of +(22/1.4)% damage. 5% Melee is worth +4.25 BtH, with 44% Melee, 44/5 = 8.8, so 4.25*8.8 = 37.4 BtH. So split that into two turns of -18.7 MRM on the foe, so the status lasts <Hits> turns like the EleVuln. Inflict with CHA/LUK, resist with END/LUK. If in the armour and shield, the pet does +10% damage in damage mode, the EleVuln upgrades to +(26/1.4)% EleVuln for <Hits> turns, and -22.1 MRM DefLoss for <Hits> turns. MC Water guest. Has a single-hit slash and a three-hit stab attack. 5% MC translates to +4.25 BtH, so a player controlled trigger being 7.5% base means +6.325 BtH. It gains BtH equal to (PlayerDEX/VStat)*6.325, capped at 8.5 BtH (Equivalent of 10% or double MC) if you have DEX beyond the assumed VStat. May I ask for info subs on Skele-Brain please? I have not been able to find them anywhere and I assume they have not been posted yet. Fire clone of the Griffin pet. That version did the old "Attempt status, if the status is up do the +5% damage attack", this one will be using the toggle bit as per usual with our modern deals. Attack1 is just +5% damage, Attack2 gives up 50% damage + MC for a -10.5*MobFireRes BtH Blind that lasts <Hits> (max 3) turns. Inflict with CHA/LUK, resist with DEX/LUK, 50% save. Generate 9 * [1 + CHA/VStat] Tranquility Charges per turn, to a max of 20. 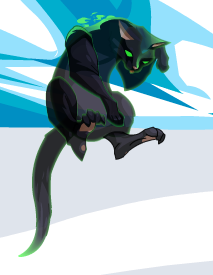 If you are 10 or more levels above the pet's PowLvl, then this is decreased by 4 charges. If you are 15 levels above, 8 charges total. 20 levels is -12 charges, 25 is -16, and 30 is -20. MC Light Magic pet. Attack is four hits, +4 BTH lean. Decimal values are rounded randomly, except on the shield. Now available in Summon and Call flavours! Paralyses the enemy. Doesn't require a hit. The monster can resist with a save at a +7 bonus (inflict with CHA/LUK, resist with END/LUK). The paralysis lasts for (1*[Monster Energy Resist]*[CHA mod]*[Dunamis penalty]) rounds, where [CHA mod] = 0.5 + 0.5*CHA/VSTAT. Magic Light pet, neutral base/rand and BtH leans. MC effect is same as the weapons, +10% damage vs Dazed/Sleeping foes. Scales like the weapons as well, numbers below are for examples. Also, it's possible that I missed them, but I haven't been able to find info subs for the guest avaibale through the Neko house. Edit: I also don't see numbers for the Sol and Luna guests. I'm assuming they're standard ele-seeking guests in their respective elements, but I can't find numbers to confirm. Ranged Water breath attack, 1 hit, -50% damage. If it connects, the monster becomes Unlucky (-100 LUK, 1 turn) and you become Lucky (+100 LUK, 1 turn). The monster can resist with a save at a +0 bonus (inflict with CHA/LUK, resist with DEX/LUK). Here are the pets and guests from among the items on the list that I managed to put together, IMR. See the weapons thread for more details. Skele-Brain, Saber-Toothed Grenwog and Thunderbird Egg. Both Katshiro variants, Zorbot plus its variant form, the latest incarnations of the Sol and Luna guests, the latest version of the Nightbane guest as summoned by the Clawclub and Clawstaff and the Royal Raven. Can click on it to have it deal your foe's base element. In this mode it does *130/115 damage. This resets at the end of battle. Seeks between Energy (2 hits, Melee Energy) and Fire (1 hit, Ranged Fire). Regardless, its attacks do -12.5% damage. At the end of the turn, the monster takes -[hits]/[attempts]*sqrt(monster power) blocking. This is rounded down, but the fractional part is saved for when you're inflicting it next turn. The monster can resist this with a save against Defence Loss at a +0 bonus (inflict with CHA/LUK, resist with END/LUK). Cute Deery: attack is one hit, +10 BTH lean, -25% damage. Regardless, the monster becomes Blind (-22.8*[LIGHT] BTH (rounded randomly), 1 round). The monster can resist with a save at a +10 bonus (inflict with CHA/LUK, resist with CHA/LUK). Scary Deery: attack is one hit, -10 BTH lean, -25% damage. Regardless, the monster becomes Afraid (26.8% chance, 1 round). The monster can resist with a save at a +10 bonus (inflict with CHA/LUK, resist with CHA/LUK). You can feed it 200 candy to boost its attacks for one turn. One hit, Melee Earth, +5% damage. An extra +100% damage if you fed it candy. Two hits, Ranged Earth, -68.231% damage. There's a [40*Connects/Hits]% chance of Petrifying the monster (1 turn). The monster can resist with a save at a -10 penalty (inflict with CHA/LUK, resist with END/LUK). If you fed it candy, then the damage penalty increases to 78.077% and it's a [100*Connects/Hits]% chance instead. These all scale, the #s below are for example's sake. Each one has a different effect. Twilly: Earth element, toggles between Earth damage and healing for MC. Quibble: Wind, toggles between +5% damage and attempting to inflict Paralysis. Pays half attack damage + MC (so 22% Melee) for a (37*MobWindRes)% chance to attempt a 1 turn Paralysis (the mob gets distracted looking at Quibble's selection of trinkets and such), has a 50% save, inflicts with CHA/LUK and is resisted with CHA/LUK (ability to keep focus). Rez: Light, deals +7.5% damage if your current class title is Paladin or if you are in a Paladin armour. Zorbak: Darkness, deals +7.5% damage if your current class title is Necromancer or if you are in a Necromancer armour. Scurvy: Water, deals +7.5% damage if your current class title is Pirate or if you are in a Pirate armour. 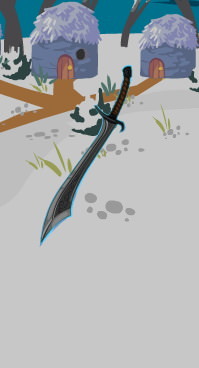 Twig: Ice, has a 0.9 random lean, when he attacks he does anywhere from +25% damage to -15% damage. Zilla: Earth, if fighting a Zard, deals +10% damage and changes element among Fire/Ice/Water/Energy/Earth/Wind/Light/Dark to deal the most damage. Three hits, +5 BTH, +5% damage. I can't think of a way for Sleep to stack, so if Sleep is active then Memet defaults to the damage attack. One hit, -75% damage. If it connects, the monster becomes Poisoned (3 rounds, power:2.5). The monster can resist with a save at +10 bonus (inflict with CHA/LUK, resist with END LUK). One hit, Magic Fire, +10 BTH lean, +100% damage (excluding LS damage). This costs [40% of a Melee skill] in SP per turn. If you can't pay, you do the other attack instead. One hit SP healing, *9/8*0.9*0.85 damage. One hit healing, *0.5*0.85 damage. You gain an Element Shield (-11/70 damage, Water only, 1 turn). The reduction is multiplied by *[0.5 + 0.5*CHA/VSTAT], to a max of *1.1. Frostval giftbox item: Ice Guardian Dragon Jr.
MC Ice pet, Attack is two hits, Magic Ice. MC: One per battle, you can click on it to have it do a Freeze attack (on its turn). The attack does -66.7% damage. If both hits connect, then the monster is Frozen for one turn. The monster can resist with a save at a +20 bonus (inflict with CHA/LUK, resist with END/LUK).